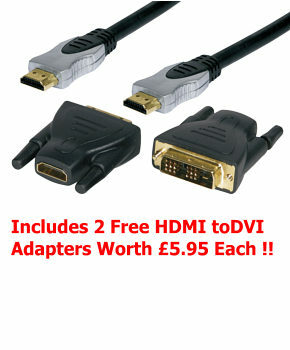 2m HDMI Cable, HD Connection Kit with 2 Free HDMI to DVI Adapters. SLX Gold 2m HDMI cable HD connection kit. Compatible with HDTV, Sky HD, Blu Ray DVD, Virgin Media, PS3 and Xbox 360. Suitable for resolutions up to an including 1080p. Oxygen free copper conductors (OFC) to minimise signal distortion. Gold plated connectors for uncompromising signal transfer. Multiple shielding for optimal signal transmission. Dielectric core construction for lasting performance. SLX Gold 26608H, 2m HDMI Cable connection kit, with 2 free HDMI to DVI adapters. HDMI Switch, 3 Way Automatic and Manual Switcher. Allows you to connect up to 3 HDMI devices to a single HDMI input. 3 inputs, 1 output. Supports 12-bit Deep Colour. 24k Gold plated connectors. Multifunctional switching : Intelligent/Manual. Resolutions up to 1080p. Computer resolutions up to 1920x1200. HDMI/HDCP pass-through. Built in 56cm HDMI cable on switch output. Compatible with Blu Ray DVD Players, Sky HD, PS3 XBox 360 Freesat HD, Virgin HD and many more. Konig HDMI to VGA Converter, Video and Audio HD15. Allows an HDMI equipped device to be connected to a VGA input, eg Sky HD to a monitor or projector. HDMI input connector for connecting a standard HDMI cable. Output connectors - VGA HD15 and 2x phono sockets for audio. Supports HDMI resolution: 480i, 480p, 576i, 576p, 720p, 1080i en 1080p. Supports Analogue Video output up to UXGA and 1080p with 10-bit DAC. HDCP 1.2 support. Power supply included. Split an HDMI signal to 8 TVs. Connectors 1x input HDMI female, 8x output HDMI female. Supports full HD 1080P, 4k and 3D. Resolutions: 480i, 480p, 576i, 576p, 720p, 1080i, 1080p and 4k x 2k High performance 1.65GHz bandwidth. HDCP compliant. All metal housing 5V 3A PSU included. The 4k HDMI splitter is a distribution hub that sends the same HDMI output to multiple displays such as HDTV’s or monitors. They can be cascaded to allow a larger distribution. Simply connect source to splitter and splitter to displays with HDMI cables to enjoy a high quality visual experience. Capable of up to 4K resolution and 3D. Recommended maximum cable distance is 5 metres from source to splitter and 15 metres from splitter to display. 3m High Speed HDMI Cable with Ethernet and Audio Return Channel HQ Silver Series Premium HDMI Cable Supports ethernet channel, ethernet via HDMI. Supports audio return channel to send audio back from a display to source. Supports 3D over HDMI, 3DTV, Sky 3D and 3D Blu Ray. Supports 720p, 1080i, 1080p, 2160p and 4k x 2k (4096 x 2160). Supports extended colour spaces eg x.v.colour. 99.99% Pure OFC copper cable. 24k Gold plated 19 pin HDMI A male connectors. Metal shelled connectors provide enhanced shielding and durability. Ferrite supressors reduce the risk of interference. Mylar backed foil shielded oxygen free copper twisted pairs for high speed HDMI. Supports HDMI 1.4 and HDMI 2.0 equipment functions Backward compatible with HDMI 1.0, 1.1, 1.2 and 1.3. Ideal for connecting 3DTV, Sky 3D, 3D Blu Ray, PS3, XBox 360, Blu Ray DVD, Sky HD, DVD Recorders, Virgin Media HD, Freesat HD etc. Length 3 metre.